Here are the staff that are currently employed at the JBC. Justin is the editor of the JBC and a local of Peach Creek. He started the Jawbreaker Chronicle as a way of showing the people of the world what goes on in this cultural wasteland of Peach Creek. He currently resides in the Culde-Sac. (Third house from the left) He is also a business major and currently works on the Business-Ed section of the paper as well. When asked why he didn't start a company he responded saying that he did try but he didn't know that it was real money that he was throwing out the window. His moto: If it ain't broke don't fix it! What ever that means. From the time he was little, Eric dreamed of being a doctor. Unfortunately for him, he was kicked out of medical school only a week after he started. This did not stop him though! Two weeks later he finally achieved his dream. Others were skeptical at first, but he proudly showed around his degree which he said was legally obtained. 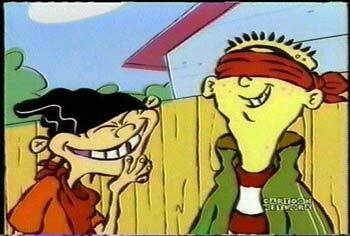 About a year later, and several malpractice suits later Dr. Eric discovered Ed, Edd, n Eddy. Immediately entranced, he quickly taped every single show and watched them over and over again until the tapes disintegrated. One day, Dr. Eric was contacted by his friend Justin who was putting together an Ed, Edd, n Eddy newspaper for Peach Creek. Eager to lend his support, Dr. Eric accepted and moved to Peach Creek where he became a reporter and staff doctor. To this day Dr. Eric writes for the Jawbreaker Chronicle and when asked if he would ever stop, he said that as long as his appendages functioned properly he would keep on writing until he expires or dies, whichever happens first. Lynn comes to the JBC from Create an Ad.com which she was fired from after she tried to create rat poison flavored chewing gum. The JBC was impressed right away. So now she creates the greatest Ed ads anyone has ever seen. Our new sportscaster has arrived! Get ready to see a sport article every issue. Although he has a problem realizing what sport is actually going on he knows what he is doing... Trust us. Daniel is the JBC's photographer who is responsible for all of the photos that you see here at the JBC. He is also our intern. He gets us food and drinks and every now and then attempts stand up comedy. Although everyone else finds him humorous Dr. Eric insists that he keeps his day job. Tyler is a unique individual who every now and then comes to work wearing a purple and green jump suit which is creepy. You may catch some of his articles on here and believe me we are talking about unique. Blake is a young writer and is respected at the JBC for his attempt to steal Justin's soda which only cost him a few missing teeth. You may have already seen some of his great articles. In the future Blake don't touch Justin's soda. Blake is also the JBC weather guy. He sometimes gets hurricanes and tornadoes mixed up but he was the only weatherman available to the JBC. Needing a new servant...Er um writer Justin placed an ad out and sure enough someone replied to it. (Imagine that) Returning back after getting everyone else lunch Jon discovered a wicker basket sitting by the door. Since curiosity is in his nature he opened the basket. Inside the basket was Jacob. When asked why he was in the basket he had no comment. Thus a new JBC writer has been added to the site.